Fully refurbished HP Laserjet 4v, please also check below for the accessories we offer for the model 4v. If you have any questions feel free to Email, FAX or Call us. We also offer REPAIR service on this model of printer, if you wish to have your printer Repaired please Go Here. This printer is great designers, draftsmen, or anyone who needs to print on larger 11x17" paper. Recommended for printing any text documents, small to large spread sheets, small to large forms, and graphics up too full page 11x17. 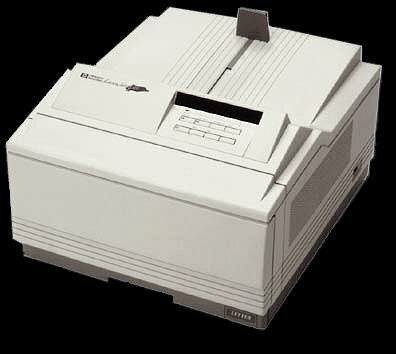 Having the fastest processor in it's series (33MHz Risc processor), makes this printer perfect for printing anything from 5x7 index cards all the way up to 11x17" paper. High-speed Bi-Tronics parallel port with built-in I/O buffering frees up your computer faster when sending print jobs. All this makes the great for the designer or architect wishing to print design drawing on 11x17 paper. Comes standard with Dual Input, 250 Sheet Cassette (Letter Size) and 100 Sheet Multi-Purpose Cassette.